Worried the world might let you go two straight days without some nifty Game of Thrones fan art? Relax. 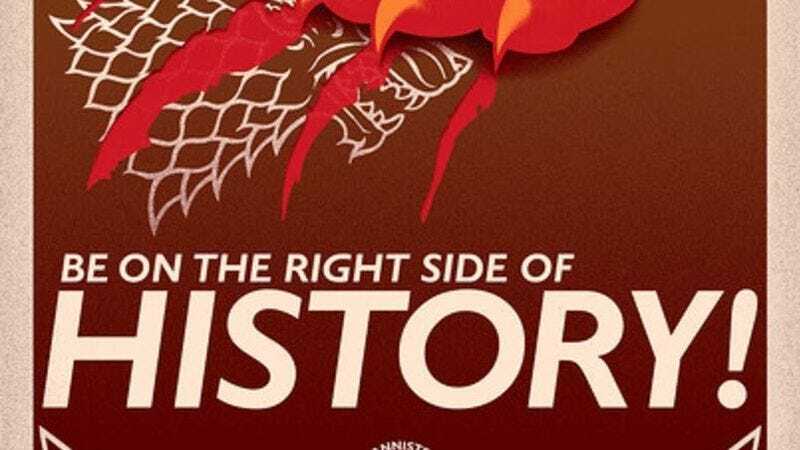 Today's images come courtesy of designer Olivia Desianti and answer the question on almost no Game Of Thrones fan's mind as they look forward to the Season 4 premiere: If the clashing factions fighting for control of Westeros' Iron Throne fought on opposite sides during World War II, what would their propaganda posters look like? Desianti uses bold lines and saturated colors to ape the style of the day, and whether you're Team Lannister, Team Targaryen, or Team Arya With a Sword, everyone can agree that these are pretty mean fake posters. Declare your allegiance further by patronizing Desianti's Etsy page.